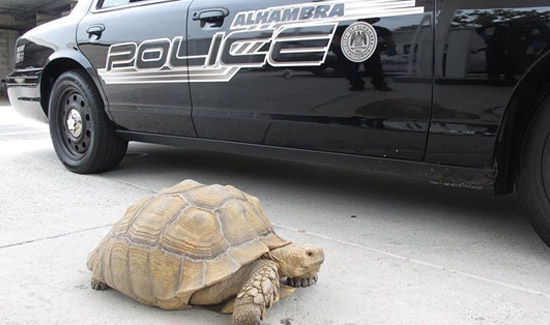 A giant tortoise spotted wandering — albeit slowly — around California on Saturday has been reunited with its family, the Alhambra Police Department says. “According to 21310 of the Penal Code, it is illegal to possess a [tortoise]. We enjoy keeping families together, so an exception was made in this case,” the department posted Sunday on Facebook. The reptile, named Clark, weighs 150 pounds, and it took two officers to take it in to the local police station.